Both Pope St. John Paul II and Pope Benedict XVI preceded Pope Francis in beatifying or canonizing saints who were martyred during the Mexican Cristero War (1926-1929). The holiness of these saints was proven in the circumstances of a religious persecution. The Catholic Church was severely weakened by the Mexican government in the Cristero War. Church properties were seized, schools and other Church institutions were closed, and priests were exiled or murdered. Not just priests were martyred during this tragic period of history in the Mexican Church, however. Many laypeople suffered death to defend the right to religious freedom, and one of the Church’s newest saints was among them — St. José Sánchez del Rio. He’s commonly referred to today as “Josélito,” a diminutive and endearing form of his name that recalls his young death. At first denied permission to join the Cristero rebel movement because of his young age, the boy didn’t relent. When his mother expressed her opposition, he said, “Mama, do not let me lose the opportunity to gain heaven so easily and so soon.” José’s persistent desire to give his life for Christ and others won out, and the general permitted him to be the troop’s flagbearer. Members of his troop gave him another nickname — Tarcisus — after the young early Christian saint who sacrificed his life to protect the Eucharist from sacrilege. In late January 1928, José was captured by government officers. It was a sad circumstance: He had given his horse to the general of his troop, sought shelter and fired at the enemy until he ran out of ammunition and was captured. The young prisoner of war was taken to a makeshift cell in the sacristy of a nearby church. According to the witness of childhood friends, while there, he prayed the Rosary daily and prepared for his impending death. He was ready to do God’s will, emphasizing this in a heart-wrenching letter to his mother. His father attempted but failed to secure his release. José never had a trial but was offered the chance to live if he would renounce his faith. He refused. Hoping to weaken him in his determination, his persecutors brought him to witness the hanging of a compatriot. Instead of recanting his faith in Christ, José heartened him, saying they’d soon see each other in heaven. Finally, they reached the cemetery — the place of his death — and, with bayonets, his persecutors stabbed him repeatedly. Their commander, however, shot him, frustrated with the slow, agonizing death his underlings rendered the boy. Just before dying, José traced in the dirt. It was a cross, which he bent down and kissed. His feast day is Feb. 10. Giving alms has always been an important part of Lent. For many people, it means giving money to Catholic charities or some other good cause. But the concept of almsgiving goes much deeper. It is our response to the teachings of Jesus that encourage us to reach out to people in need—not just with our money—but with our time and our talents. Today we might call it ‘stewardship’. Lent gives us the opportunity to cultivate a spirit of generosity. It gives us a chance to share what we have and who we are with other people. It puts us in communion with others and helps us understand that we are all members of the Body of Christ. Think carefully about how you will share your time, your talents and your treasure during Lent. Keep in mind the words of the Lord Jesus who himself said, “It is more blessed to give than to receive” (Acts 20:35). When you think of Lent, what comes to mind? Each of these involve some sort of giving. In fasting, we give up certain foods. In almsgiving, we give money and aid to those who are in need. But what about prayer? What are we giving when we pray? St. Paul, in his first letter to the Thessalonians, exhorted his readers: “Pray without ceasing. In all circumstances give thanks, for this is the will of God for you in Christ Jesus” (1 Thes 5:17-18; cf. Eph 5:20). The Catechism of the Catholic Church says, “‘we have not been commanded to work, to keep watch and to fast constantly, but it has been laid down that we are to pray without ceasing.’ This tireless fervor can come only from love. Against our dullness and laziness, the battle of prayer is that of humble, trusting, and persevering love” (No. 2742). Lent is a journey in love, and prayer is an essential part of both that journey and that growth in love. With this in mind, what follows is a Scripture-focused guide to praying during Lent. It is meant for personal reflection and prayer, and to accompany the public, communal and liturgical prayers of the Church, all of which are ultimately focused upon and find their deepest meaning in the Eucharist: “the source and summit of the Christian life” (CCC, No. 1324). 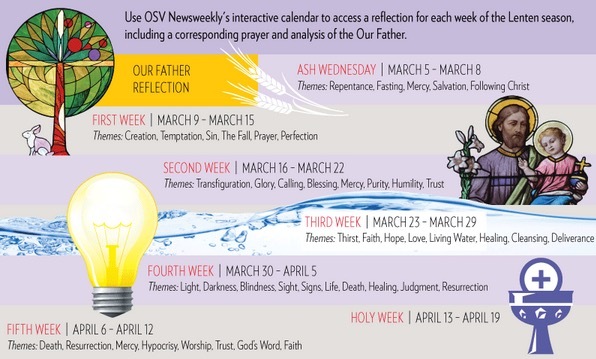 Key themes and ideas from each week of Lent are given, drawn from the Mass readings, and a particular focus is given to the “Our Father,” for it “‘is truly the summary of the whole gospel,’ the ‘most perfect of prayers.’ It is at the center of the Scriptures” (CCC, No. 2774). In addition, each section contains a prayer selected from Church tradition that can be prayed during that specific week. Carl E. Olson is the editor of Catholic World Report. See the full version of the Lenten calendar here. This article originally appeared in the OSV Newsweekly. When Did the Magi Visit? Comments Off on When Did the Magi Visit? Luke mentions the circumcision of Jesus on the eighth day, in accordance with the Law. And though the place of the circumcision is not mentioned, it was likely in Bethlehem…. Luke mentions the circumcision of Jesus on the eighth day, in accordance with the Law. And though the place of the circumcision is not mentioned, it was likely in Bethlehem. There is also the event of the presentation of Jesus in the Temple. The presentation of the firstborn generally took place about 40 days after birth (which Christian tradition recognizes). It seems likely that the Holy Family went to Jerusalem from Bethlehem for this. As you note, it would be unlikely that Mary, who was observing the usual period of convalescence for a woman after giving birth, would have gone all the way back to Nazareth, a round-trip journey of 140 miles. After the Presentation we may presume that the Holy Family returned at least briefly to Bethlehem, and some time after their return the Magi made their appearance. This was followed shortly after by the flight to Egypt. Some scholars put the visit of the Magi as late as two years after the birth of Jesus since Herod called for the death of all boys two and under. However, it is difficult to understand why the Holy Family would have stayed in Bethlehem that long, and we can reasonably assume that the Magi visited sooner than two years. Some are troubled by the fact that Luke seems to say that they returned to Nazareth after the Presentation and that he makes no mention of the flight to Egypt, though Matthew does. But Luke’s silence about the Holy Family’s travels to Egypt does not amount to a denial of it, any more than the fact that Matthew makes no mention of the circumcision or the Presentation does not amount to a denial that they happened. Both Evangelists are merely selecting the material they deemed important.